Smoke Shack Jerky describes itself as a "small Upstate NY kitchen" that launched in 2017 by Jonathan Brown of Rochester, NY. Their unique angle is smoking jerky over real wood, and using thicker cuts of meat for a beefier chew. They don't use any smoke flavoring, and no preservatives. The company also has a line of smoked nuts. Brown also chose to develop jerky recipes based on cultures found around the world as opposed to the more common profiles found with mass-produced brands. This "Fuman Chew" is described by the company as a, "spicy blend of Japanese-style jerky with a fierce roundhouse kick". The first taste I pick up is light red chile pepper, with a touch of heat brewing. There's a light smoke following, along with a faint salt. The chewing brings on the earthy chili powder and paprika, followed by a steak-like flavor towards the end. As for being described as a "Japanese-style jerky" and having a "fierce roundhouse kick", I don't taste anything Japanese in this. I mean, yours truly here is a Japanese-American, and grew up with Japanese cuisine and even lived in Japan for 18 months. It's not even teriyaki, or even close to typical Japanese-style stir-fry beef that a Japanese housewife would throw together in a hurry. Moreover, there's no fierce roundhouse kick, assuming its referring to chile pepper heat and not just a reference to Karate. There certainly is a light bit of heat, it's just not "fierce" nor a "roundhouse kick". It's more like a brat little kid kicking you in the shin on a crowded bus. It rates a, "mild medium" on our heat scale (level 2/5). Otherwise, the primary taste profile is a light red chile pepper and cayenne over an dusty, earthy chili powder on top of a lightly flavored soy sauce. Despite the use of brown sugar and molasses, it's not sweet at all. The meat consistency looks great in terms of little to no signs of fat or stringiness. It is a thicker sliced meat, generally easy to bite off and chew, but rather dry. The chewing texture feels very meaty, and almost a steak-like feel. Most of the pieces, however, are cut into small chunks and bits, which may necessitate having to grab 2 or 3 at a time to get a decent mouthful. 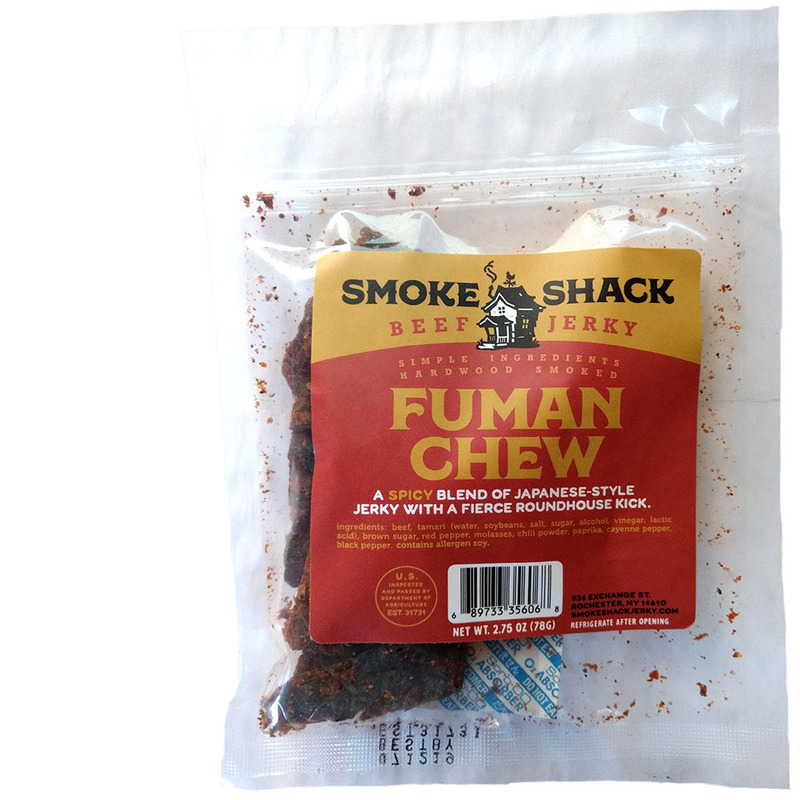 This Fuman Chew variety from Smoke Shack Jerky creates a unique combination of red chile pepper & cayenne layered over an earthy chili powder and paprika to deliver a rich seasoning that recreates the sense of eating red beef chili. While the company describes this as a Japanese-style influence, it's doesn't have any flavor characteristic of the Rising Sun. It's actually more of a West Texas-style for its red chile influence and its beef chili palate. The thick slices of beef give out a steak-like flavor, though they tend to chew dry. 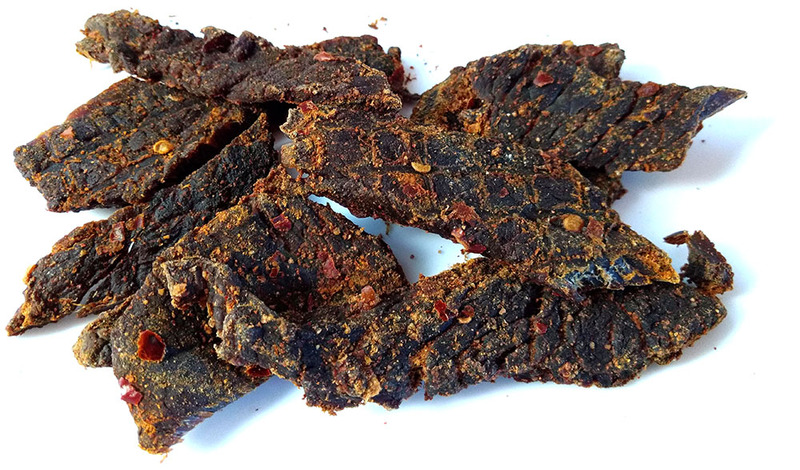 Overall, it's a very meaty, almost beef chili-style jerky with bold red chile pepper flavors, but not excessively hot.